Renowned London artist 16B prepares the final instalment of his three part ‘B4LP’ series ahead of this year’s album, featuring four varying cuts demonstrative of his diverse production abilities. Omid Nourizadeh is a bonafide house and techno legend with a genre-pushing career that includes remixing the likes of Lana del Rey, The Cure, Todd Terry and Gus Gus, releasing on seminal labels like Bedrock, Tsuba and Yoshitoshi, not to mention curating mix comps such as Balance 13 (SOS), Sounds Like Alola and Ministry of Sound (Club series – SOS). 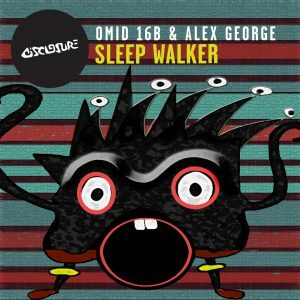 Whether as a producer or as a DJ, Omid has purveyed a wide ranging scope of dance music since day one and he has continued to do so with his ‘B4LP’ series, with the first two releases reflecting his wealthy experience as a producer of various different forms of house and techno. However, in his next outing the Alola founder goes even further, assembling four genre-spanning tracks pre-empting the broad aesthetic of his forthcoming album. Written at the time of his daughter’s birth, ‘Love’ is a tantalising beatless piece that’s charged with emotion and marks a pivotal moment in Nourizadeh’s life. ‘Remember 89’ then moves into club territories, with an array of organic percussion and crystalline melodies, it’s a record made for dancing that draws on the nostalgia of the early days of raving. Moody from the off, ‘Fight’ is a high-tempo electro roller with aggressive drums and fuzzy synths, making way for ‘I See You’ an otherworldly ambient production which Omid recorded live in one take whilst playing with modular set ups during a recent stay in Tokyo. 16B ‘B4LP EP (Part 3)’ drops on Alola Records on 28th May 2018.